A new route to an existing intermediate in the total synthesis of natural antibiotic platencimycin as reported by Magnus/Rivera/Lynch (Org. Lett. 2010). See previous posts here and here. As always in this type of work for each synthetic step many methods exist but only one will work as this report nicely illustrates. 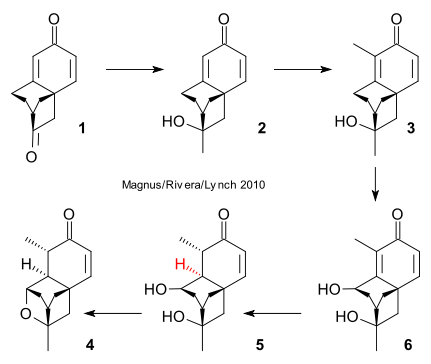 Known spiroketone 1 was reacted with methylmagnesium chloride (THF, -78°C) to alcohol 2 .MeLi did not work: enolization of the other keto group. Reaction with t-BuOK / t-BuOH and MeI gave alpha-methylketone 3, oxidation of which (oxygen, tetra-n-butylammonium bromide, KOH, t-BuOH) gave diol 4. Trimethyl phosphite did not work: secondary peroxide reactions. Enone reduction (LiAl2H2(OEt)2, THF, -78°C) gave 5 with correct stereochemistry . Finally reaction in DMSO (170°C, microwave) gave ether 6. TFA did not work: epimerization at the alcohol group.